SMART MISSILE (AUS) (Bay 2008-Stud 2012). 3 wins-2 at 2, ATC Todman S., Gr.2. Leading Aust. First Season Sire 2015-16. Sire of 166 rnrs, 83 wnrs, inc. SW Debellatio (WATC Sires' Produce S., Gr.3), I'll Have a Bit, Exocet, Sassy 'n' Smart, SP Rocketeer, Smart Amelia, Smart Manoeuvre, Fromparis Withlove, Hair Trigger, Jericho, Mediterranean, Stephenstihls and of Smart Coupe, Ahndras, Cadogan, Royal Missile, Thaad, Acceptile, Aim Smart, etc. Gadfly (g. by Smart Missile). 3 wins to 1250m, A$83,435, to 2017-18 in Aust. Distinctive Flyer (f. by Flying Spur). 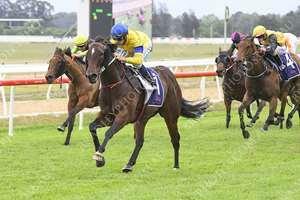 Winner at 1100m in Aust. STAVKA (Xaar). 7 wins to 1400m, A$237,900, VRC Hong Kong Jockey Club S., L, MVRC Hats off to Des Gleeson Flying H., VRC Terry Watson H., Rashlore H., 2d VRC Aurie's Star H., L, 3d MVRC Orient Express Travel Group H.
SPECIALIZE (Bluebird). 6 wins to 1350m, A$158,608, AJC June S., L, STC Saratoga H., Port Jackson Flying Welter H., Leopardstown H., Londonderry H., 2d STC Civic H., L, AJC Grey Receiver H., Gallipoli Flying Welter H., 3d Gosford RC Pacesetter S., L, NSW Tatt's RC Carrington S., L, AJC Raconteur H., 4th STC Satellite S., L. Sire. BOMBER BILL (Air de France). 23 wins-7 at 2-to 1400m, A$1,892,330, MVRC Australia S., Gr.1, SAJC Goodwood H., Gr.1, WATC Karrakatta P., Gr.1, AJC Challenge S., Gr.2, MVRC Schweppes S., Gr.2, AJC Liverpool City Cup, Gr.3, MRC Rubiton S., Gr.3, SAJC DC McKay S., Gr.3, RN Irwin S., Gr.3, VRC Gilgai S., Gr.3-twice, WATC Sires' Produce S., Gr.3, MRC Kevin Heffernan S., L, VRC Hilton on the Park Sprint H., L-twice, Kensington S., L, WATC Perth S., L, 2d QTC Cup, Gr.2, MVRC Schweppes S., Gr.2, MRC Rubiton S., Gr.3, SAJC RN Irwin S., Gr.3, VRC Bobbie Lewis H., Gr.3, 3d QTC Cup, Gr.2, VATC Rubiton S., Gr.3, STC Satellite S., L.
DEMOGRAPHIC (Gold Brose). 4 wins to 1400m, A$199,050, VRC Frances Tressady S., Gr.3, MRC Love a Show H., December H., SAJC Nuclear Debate H., 2d SAJC New Year's Gift, L, MRC Highways Tabaret H., VRC Maybe Mahal H., 3d VRC Mark Sensing H., MRC Regal Vista H., 4th SAJC Swettenham Stud S., Gr.2. Producer. KURO (Denman). 8 wins-1 at 2-to 1200m, A$692,525, to 2016-17, ATC Starlight S., L, Heritage S., L, Brian Crowley S., L, BRC Mick Dittman P., L, Gosford RC Takeover Target H., L, 2d ATC Galaxy H., Gr.1, Expressway S., Gr.2, 3d VRC Coolmore Stud S., Gr.1, BRC QTC Cup, Gr.2, ATC Fireball S., L.